This thing is just starting to get off the ground. 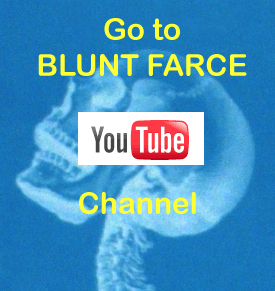 Even I’m not sure what might be around the corner or what sort of videos or animations I might end up making next… I just know that I now have a home for them: BLUNT FARCE. This site (in conjunction with the youtube channel) is still as much an idea/experiment as it is an online destination for my creative output. Thank-you very much for dropping in. Click over to youtube to watch the videos and let me know what you think. Subscribe to the channel. Bookmark this page. Follow the twitter feed. Get connected. Something is going to happen…. If you need to know more, feel free to drop us an email.